Hellooo, I'm back! I will be catching up on all of my swatching shortly, but for today I have another 26 Great Nail Art Ideas mani to share. 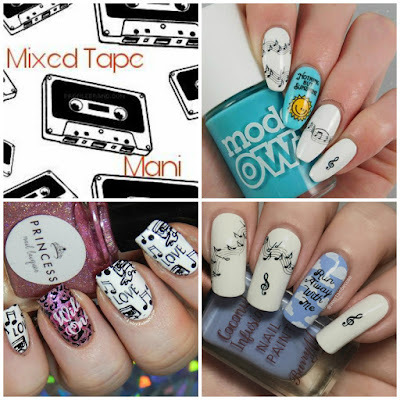 This time the prompt is 'Mixed Tape Mani'. Me, Kirsty (FairyTales Nails), and Bethany (BNailedToPerfection) teamed up to do triplet nails. We thought we'd go for a different spin on the theme, and went for actual music mixed tape nails instead of striping tape/vinyls etc. Read on for a closer look at my contribution and to see how I did it! I started off by painting my ring finger with two coats of Barry M Coconut Infusion 'Laguna', and the rest of my nails with three coats of Barry M 'Matt White'. Both are shown below without topcoat. 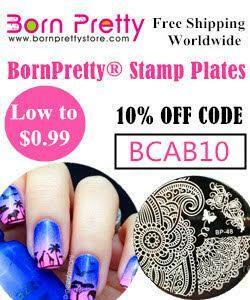 For my ring finger, I used Uberchic Beauty stamping plate 2-03. 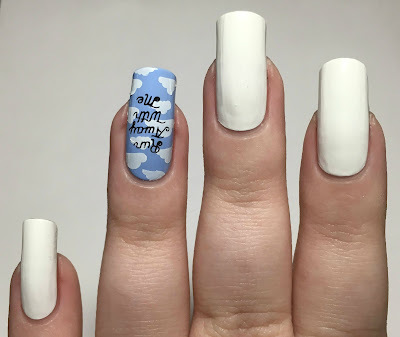 First I stamped the bottom right cloud image using Hit The Bottle 'Snowed In' and my Born Pretty Store clear stamper. After letting it dry I then stamped the 'Run Away With Me' wording over the top using Hit The Bottle 'As Black As Night'. 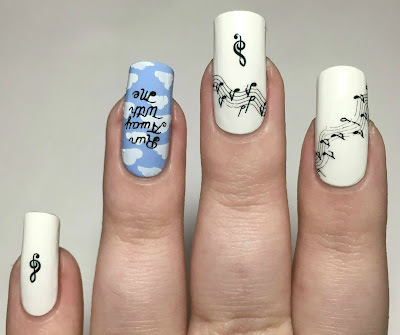 I then added music notes to my index, middle, and ring fingers using water decals (purchased from eBay here). I cut out the desired sections, softened them in water, and applied them to my nails. I carefully dabbed any excess water off before topcoating. What do you think? I actually really like them! I don't tend to use water decals often, but they're so easy to apply. Make sure you check out Kirsty's mani here, and Bethany's here. 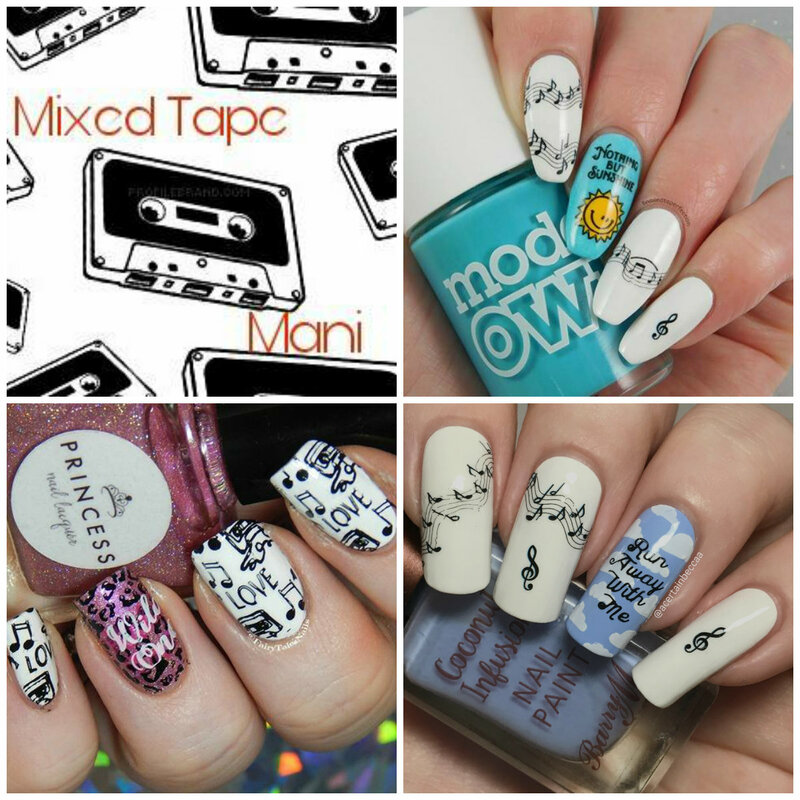 Don't forget to have a look through the other mixed tape mani's below too! These are so cute! 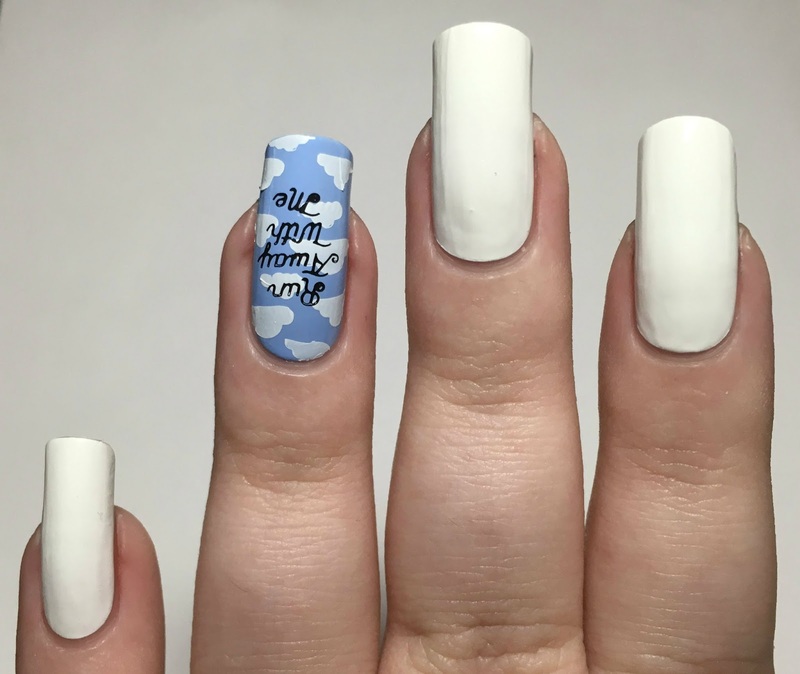 I really love how the cloudy pattern gives the whole mani a dreamy feel. Gorgeous mani and I love your take on the challenge. You all did so well. Omgoodness this is just the cutest! So whimsical. So fun! <3 Love that you guys all did a different song! 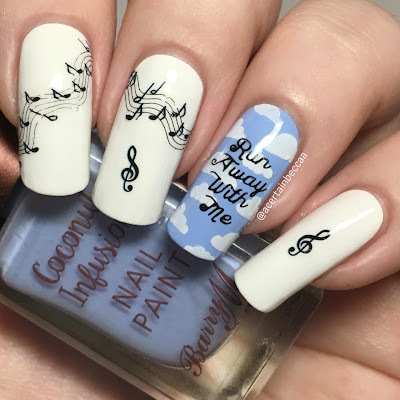 I really love this musical Mani of your, brings back so many music memories back!